But clearly I am no poet, so maybe I should just get back to I may be slightly better at; reporting the facts. We hadn’t had a smoky-meaty fix on this trip yet and we were pretty keen to rectify that situation. “Firstly, I would just like to let you know kids eat for free”, were the words from our waitress’s mouth. At that point I was truly ready to forgo the lack of dank and any other preconceptions about BBQ that I may have in my stupid, opinionated head because as our dear lord once said, “If you feed my kids for free I can buy another bottle of wine which basically makes us homies fo’ life”. We ordered, we drank, and Jennee and I laughed like the first time we met. After a perfectly comfortable time period had elapsed our food hit the table. Or more literally – our food was placed nicely on the table in front of us. We shared brisket with soured onions and truffle mayo ($34), ½ chicken with baby spinach and drunken raisins ($32), grilled broccoli with chipotle hollandaise ($10) and iceberg wedge salad with ranch and bacon bits ($8.5). The boys had buttermilk fried chicken wings and pork ribs, both with citrus ‘slaw (free for under 12s), and we got into that lot as well. It was all a very nice meal indeed. The brisket was tender and juicy, but could’ve had some more smoke, I thought. The fried chicken, the pork ribs, the sides were all very tasty but I have to say the star of the evening was the ½ grilled chicken – tender, juicy, smoky and a heap of other great adjectives used to describe great tasting meat. It was some of the best grilled chook I have ever eaten, hands down. That with the iceberg salad took me to my very happy place. We followed that up with a whiskey chaser and some dessert. All of the desserts were good but if you do not try this pecan pie ($15) you are a stupid, stupid man… or lady… it is really good pecan pie. Probs not so good if you are allergic to pecans though, but you’ll work that out I’m sure (or possibly become fodder for natural selection). So for your dinner you shall be eating ½ chicken, iceberg salad, pecan pie, whiskey. Check. *A freshly swept doorstep which was later defiled by a young lady emptying the booze from her stomach into the gutter as the tables of diners at Prohibition watched on. We were the only table that cheered even a little bit. The food truck scene is alive and well in the South Island of New Zealand. Even the little alpine town of Methven has a food truck or two. One of those food trucks is called Truck Norris. My dear wife Jennee decided she would call it “Walker, Texas Griller”. Truck Norris is run by a guy named Matt. Matt told us he really liked cooking BBQ. Matt made some really tasty BBQ. There was a nice little corral type set-up to keep Matt, his food truck and his two Johnson Smokers’ cohorts safe from the admiring crowds who would be gathering soon for a little taste of some top notch Texas style BBQ – The girls that would be chucking their knickers at him and gesturing to him with their tongues gently caressing their lips. The guys who would get emotional because the smoked meat is so damn delicious… and then they would become even more emotional (like, tears emotional) because “emotional” is a feeling they know not how to deal with (but they would still have enough wits about them to have their facial hair ready to smuggle a few morsels out of the yard for later). The dogs and the cats would get along together, just to share a little of that smoky goodness, a few fries with Matt’s special seasoning and maybe a little of that black-eyed bean salad. Yes, the world would get a little crazy just for a second, thanks to Truck Norris and it’s purveying of tasty smoky goodness. It would be defo worthy of pulling off the highway (if there was actually a highway… perhaps it was just a country road…) to sample some of these smoky delights. Actually, you should sample all of the smoky delights… and drive all of the way from the where ever you live to do it. Drive there from where ever and try all of the meats and all of the sides. Your face will love you for it. This was a good looking bar and BBQ joint type scenario. There were comfortable seats, central heating and 15 NZ craft beers on tap (changes often, we were told), which is fine by me because I really don’t mind seating on a comfortable seat, in a warm environment while sipping on a craft beer from NZ. The staff were nice. They bought us food and drinks upon request. They were very nice indeed. We ordered “the BBQ platter for the squad” ($80). I’m almost positive this was not the name of the BBQ platter we ordered, but I also know it sure as heck could’ve been. That or Bobby Jones. Both very solid names for a big BBQ platter with all of the things on it. We also ordered a side of “fickles” (fried pickles) ($10) and some extra rainbow ‘slaw ($12), as we are firm believers in the “more ‘slaw is best” theory when it comes to eating half a butcher’s shop piled high on a large tray after spending varied amounts of time in a smoky oven which was “powered by pear wood and out the back in the kitchen”, we were informed. We heard the holy angels trumpet the arrival of our meal/s. The BBQ joint standard meat-holding platter was placed before us, it’s gloriously checkered interior and slightly chromed walls housed a plethora of meats. It was like visiting a petting zoo only with more eating and less petting*, which is pretty much how I like my dinner to be. Someone obviously needed to get up early in the morning to cook this deliciousness just for us and for that I was very grateful. I wonder if that someone needed an alarm or if they were naturally an early riser… I’m just curious, that’s all. The meats were all smoky and tasty BBQ treats. Tasty as bro. 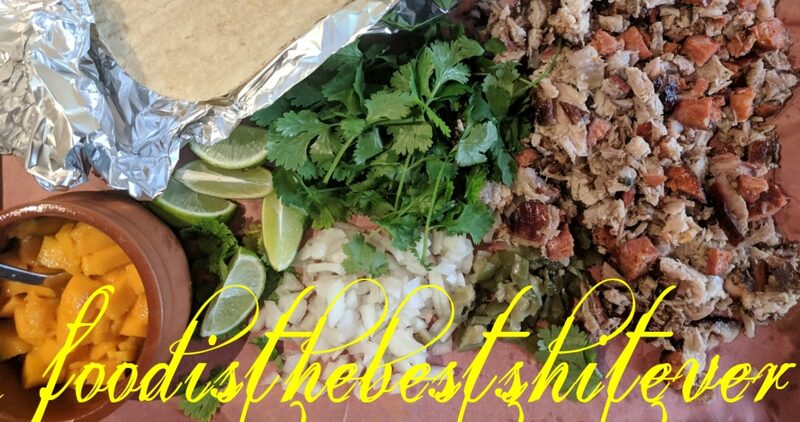 The brisket and the jalapeno sausage were stand outs, as were the fickles, and if you visit this place I would suggest that you make sure your order contains these three things if you’d like to remain friends. *There was actually zero petting perpetrated on this evening because even though New Zealand may be a little more relaxed in its rules than Australia, I’m pretty sure it is not that relaxed. This place was a nice little southern soul food type joint. It was not at the time of our visit, and to my knowledge nor is it now, a BBQ joint. I’ve just chucked it on the list because it did serve some tasty assed, southern inspired fare. “Right on trend”, other reviewers who are real reviewers may say of this restaurant in their magazines and newspaper dining guide reports. Also, I would hope they might have something nice to say about the food. We ordered quite a large pile of it and we were pretty damn impressed with the whole shebang. One thing I noticed straight away is that these folks paid a little more attention to their sides and smaller dishes, where as it is quite common for this “style” of food joint to neglect the sides a little, like parent may neglect a new step child, or even as the average redneck turtle farmer may neglect his or her personal hygiene. Please don’t get me wrong, most of the sides we have had at every other joint on this trip have been pretty on point, but just a little under seasoned here, or a little over cooked there, but generally on point. But Orleans was 100% on point with the lot. On point (I thought maybe I should say that one more time). Fried brussels sprouts with andioulle and corn bread crumb ($12), baked beans with maple bacon ($10) and their ‘slaw with peanuts ($10) were all bang on, as were our mainish choices – pastrami, andioulle sausage and pickles ($18), buttermilk fried chicken with ranch sauce ($14), grilled pork belly with corn puree ($18) and fried duck wings with peanut butter BBQ sauce ($20). Our favourites were the feeding-a-late-in-life-Elvis style duck wings, for bang for your buck and flavour these things could not be beat, the fried brussels sprouts and the ‘slaw. We were consciously and constantly referring back to the “more ‘slaw is best” theory to help those duck wings and fried chicken make it through our system. If you like this style of eating, like the sort of thing you may be able to see in these photos, then I think your belly will tell you your dollars were well spent after dining here. It is worthy of note that the owners of this place also have a diner and a bar in the same laneway. They both looked pretty good but the diner was defo more our sort of vibe. I left Strange Lane (the actual name of the lane) with the knowledge required to happily recommend a pre-dinner drink or lunchtime chicken waffle burger at the Lower 9th Diner. For the bar, I have nothing. Next Post Pretty easy, using up those Sunday BBQ leftovers, cassoulet. A great foodie adventure homage style lyrical description of these tops sounding joints Mr Food. Glad you thought me old homeland was pretty, I know where I will be going next time I am in Christchurch.